Alison Ormsby for reviewing prior to publication. For centuries, the indigenous people of Ghana have loyally guarded patches of forest and accompanying streams. Though there is much local variation, these areas may be collectively considered “sacred groves.” Sacred groves can be as small as one acre; others have been mapped as large as 3,700 acres. They are believed to be the dwelling places of gods, and in some areas, are the burial grounds of royalty. Certain species of trees are considered Nyame Dua (God’s trees) and have healing powers. The sacred quality of other groves derives from reverence for an animal species that lives there, most commonly monkeys or leopards. Still others’ sacredness originates from a river or stream that is home to a water god; the surrounding woods then become a protected area. A reported 80 percent of groves protect water sources for the surrounding areas. One such grove, the Asuo Akosua stream in the Ashanti region, is protected because locals believe it is the home of a female deity. Not only is farming around the stream forbidden, but also anything that might pollute the water, like washing clothes. Logging, gathering of firewood, fires, hunting and cultivation in sacred groves are routinely banned, and in some groves, entry is restricted for women during their menstrual cycle. Some animals are generally considered sacred, while others are afforded protection only when they enter a grove. The custodians of the groves hold ceremonies and rituals of ancestral worship in the forests. Permission to take certain botanical elements for medicine is sometimes granted. As a traditional subsistence activity, farming in areas adjacent to groves was carefully regulated. The land was sacred for its ability to give food; for example, the Akan people worshipped the goddess Asaase Yaa as the representative of the land and regularly enforced days of no farming in order to keep the land fertile. The land belonged to clans, which meant that the living, the dead, and the unborn all had a stake in its preservation. Certain plants were held sacred and were given offerings before being harvested. The oral history of the Malshegu people in northern Ghana tells of their torment by Arab slave traders in the 18th century. An appeal to the Kpalevorgu deity, whose oracle is manifested in the form of a boulder under a baobab tree, finally enabled the Malshegu to triumph. Today, the Malshegu grove is protected by the community, and its lush forest stands out amid the relatively barren savannah around it. The indigenous community believes that Kpalevorgu provides them with rainfall, successful crop harvesting and fertility. At the same time, it has also protected the flora and fauna that have lost other canopy forest habitats. Another sacred grove, Jaagbo in the northern Tolon-Kumbungu district, also traces its origins to the protection of the community. According to oral history, two epidemics struck the Tolon community in the 15th century, and soothsayers determined that the people had neglected Jaagbo, the residing place of twin gods. When the necessary sacrifices and rituals were performed at certain locales in the forest, the diseases ceased to spread. The gods are believed to take the form of leopards, crocodiles, or pythons; thus none of these animals are killed or eaten. Community members regularly consult Jaagbo for help in bearing children, healing the sick and bringing rain. Joint reverence for Jaagbo also keeps four different communities allied and brings them together for annual sacrifices. The Portuguese first arrived in present-day Ghana in the 15th century and were smitten with the abundant gold they found. The British gained and held control of what was then called the “Gold Coast” until the country’s independence in 1957. European colonials divided Ghana’s land into parcels owned by individuals instead of the community, which broke down the traditional communal investment in land stewardship. They sought to grow non-native crops, which often destroyed the ecology of the local region and necessitated the use of fertilizers. 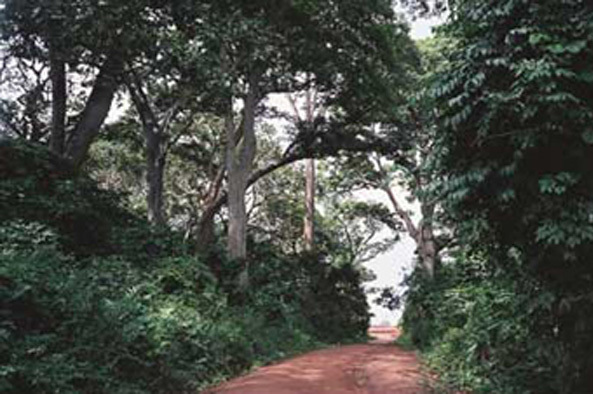 Ghana’s vast forests were harvested for timber export. Missionaries tried to replace the worship of multiple gods who were manifest in natural phenomena like trees and streams with the worship of a Christian god who was unaffiliated with their environment. Ironically, while European culture brought destruction to the land as a whole, it also sought to preserve small portions through the concept of wildlife reserves. As early as 1900, Britain passed legislation that established protected areas in its colonies. Yet the structure of these reserves reflected the European way of thinking: land inside the reserve was protected from any kind of use, while land outside the reserve was open to any kind of development. In contrast, the traditional structure and management of sacred groves incorporates graduated zones: a core zone, which is highly protected and only entered for ceremonial purposes; a buffer zone, which allows for limited use of resources, and which scientists say correlates with a high level of biodiversity; and a surrounding transition zone that may include farming and logging, managed in an ecologically sustainable way. With the implementation of wildlife reserves, the give-and-take preservation approach and graduated zones of conservation honed over centuries were dismantled, depriving indigenous people of their livelihood (rights to hunt, fish, and harvest) and the land of its equilibrium. The country’s first post-colonial wave of export timber harvesting began in the 1980s. Between 1990 and 2000, the mean annual rate of deforestation was reported at 1.7 percent, one of the highest in the world. Today, some 2,000 sacred groves exist in Ghana, making up 1.5 percent of its land. In these small patches, however, an unparalleled level of biodiversity exists, and these areas may serve as gene pools for species that have gone extinct elsewhere. Forest destruction, fueled by a growing demand for farmland and the profitability of timber harvesting, has caused the loss of the majority of Ghana’s forests. Satellite images show that virtually the only remaining forests are in the country’s 241 protected reserves, established by the British colonial government in the 1930s, and its sacred groves-about 20 percent of the original forest. Illegal logging is widespread: in 2001, while the country’s annual allowable cut was 1 million square meters, the total timber harvest was estimated at 3.7 million square meters. Livestock overgrazing and bush fires are also significant problems. The latter were traditionally controlled by creating firebreaks around the groves, but in many areas this practice has faded. Traditional medicinal plants are becoming big business in Ghana because of rising health-care costs. As a result, people from outside the sacred groves, who are inexperienced plant gatherers, have tried to profit from the market, and their collection methods often damage the plants. In addition, large-scale harvesting can upset the balance of the ecosystem by collecting large amounts of one species, whereas traditional practice employs selective harvesting techniques that can maintain the natural equilibrium. New settlers are also growing crops such as tomatoes, peppers and maize, which are not indigenous to the area and put a high strain on the soil. Further, traditional rules and methods for cultivation may not work as the population gets larger. The clash between colonial-style forest conservation and traditional land management, which started with the establishment of the country’s wildlife reserves, continues today. Communities that were forced to relocate outside the boundaries of the reserves continue to feel ownership over land inside the reserve, despite their lack of input on its management. Often they are antagonistic toward well-intentioned conservation groups, seeing the regulation of land use as further encroachment onto their culture and denial of access to the natural resources they rely on, such as edible roots and fruits, medicinal plants, spices, and materials for weaving and dyeing clothes. The federal government of Ghana has tried to conceptualize and implement a comprehensive forest preservation policy, through the Forest and Wildlife Policy Act passed in 1994 and the Forestry Development Master Plan that followed in 1996. Some experts say these policies, while well intentioned, fail to quantify desired levels of reforestation and consequences for inadequate progress. Powerful timber interests continue to find a way to get around government regulation. Illegal forestry sometimes operates with the tacit approval of the community because of their poverty and lack of respect for governmental regulation, stemming from the sense that they have been unjustly denied the means to support themselves on their traditional land. Ghana’s sacred groves have been the site of several international and local projects to document biodiversity and to pilot community-based conservation models. UNESCO sponsored the Cooperative Integrated Project on Savanna Ecosystems in Ghana (CIPSEG), which focused on the Jaagbo sacred grove, from 1993 to 1996. Preliminary research indicated that Jaagbo and its buffer zone had approximately 220 plant species, in comparison to 60 in outlying areas, and 60 percent of those plants were used as sources of medicine by the local people. The grove contains a stream with a reliable source of water in an otherwise degraded environment. Working with local residents and the regional Environmental Protection Agency, CIPSEG undertook an educational program that prepared Jaagbo for ecotourism, creating labels for various tree species, a pathway through the sacred area, and opportunities for school groups to visit. Programs like this one have the potential to enable the community to create income based on natural-resource preservation rather than exploitation. Another UNESCO project focused on the Anweam sacred grove in the Esukawkaw Forest Reserve. 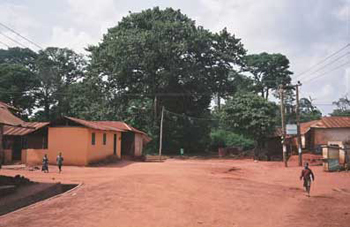 Anweam is the ancestral home and burial ground of the Asunafo royal family. Although the whole community was relocated when the forest reserve was established in the 1930s, the chiefs and elders maintain strong ties to their sacred homeland. The location of specific sites is kept secret and users of land adjacent to the reserve still pay royalties to the traditional owners. The original inhabitants, the Akyem Abuakwa and the Kwahus, have extensive knowledge of the plants and practice subsistence agriculture that integrates with the forest canopy. The project identified several challenges to sustainable land use in the Anweam grove: ethnic differences, poverty, lack of conservation education, and distrust of conservation regulations imposed from outside entities. Among the project recommendations was the need to preserve traditional knowledge, particularly by recognizing the folk classifications of plants—names that reflect the way they are used in local practice—as opposed to scientific names, which have little relevance to the local people. Two contemporary sanctuaries, Tafi Atome and Boabeng-Fiema, are famous for their large populations of rare black and white colobus and mona monkeys. The communities that surround these sanctuaries believe that the monkeys are sacred and that killing one will bring personal catastrophe. 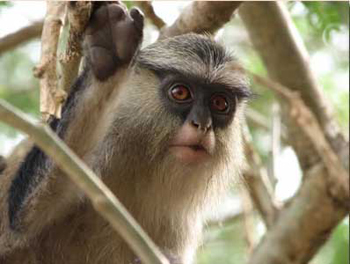 The Tafi Atome Monkey Sanctuary was established by the residents of Tafi Atome village in 1996 and contains the only remaining Ghanaian population of Cercopithecus mona mona, known as the true mona monkey. The community reveres these monkeys as sons of their gods and celebrates them in an annual festival. The core fetish grove has no walking trails that lead into it and entry is highly restricted, according to research by environmental scientist Alison Ormsby. The villagers have set up a tourism enterprise that employs local guides and operates a gift shop. Ormsby found that the community’s reverence for the forest and the monkeys remains strong and that the idea of a protected area was a truly local phenomenon. In contrast, the Boabeng-Fiema Monkey Sanctuary is an older state-run facility in which the Ghanaian government has outlawed killing monkeys and starting fires within the sanctuary. Opened in 1975, the sanctuary protects the Cercopithecus campbelli lowei and Colobus vellerosus monkeys. Here, there are also close ties to the villages of Boabeng and Fiema. Residents associate the two species of monkeys with a male and a female god, and the chief of Fiema conducts a weekly ritual at the shrine of the god Abudwo. The monkeys can be seen running freely through the village and interacting with humans. However, the traditional taboos are reinforced through government regulation, and the intrinsic belief in protecting the forest and the monkeys seems less solid in Boabeng and Fiema than in Tafi Atome. While both monkey sanctuaries have brought tourism dollars to their associated villages, the residents of Tafi Atome demonstrate a greater sense of personal investment in the future of their sanctuary. In the Brong Ahafo Region, the Ghana Association for the Conservation of Nature (GACON) developed a successful partnership with the community of Buoyem to conserve and manage a sacred grove there. By the 1990s, the region was mostly overworked farmland, but the sacred grove, while somewhat impacted, had retained a much greater diversity of flora and fauna. The grove had emerged in the 14th century as a means to protect the resident fruit bats, a traditional food for village leaders. Since the early 1980s, like other Ghanaian sacred groves, it has been threatened by the need for more farmland, hunting, collection of fuel wood, and forest fires. GACON began consulting and building relationships with the community, including the chief, who has traditional responsibility for the grove, and elders. Today, the grove supports a fruit bat population of 20,000 and healthy populations of forest and grassland plants. Community members volunteer their time to care for the grove, act as tour guides, and serve on the Sacred Grove Management Committee. The assistance of an NGO has helped fortify the reverence they always had for the grove, and to bring in skills and devices, like fuel-efficient woodstoves, that can help the local people live without destroying the grove. Even when NGOs come into an area eager to work with locals and to incorporate traditional spiritual beliefs into conservation practices, communities may view them with suspicion, conscious of long histories of Western intervention masked by new buzzwords. The most important strategy to secure the future of Ghana’s sacred groves is for the government and NGOs to support traditional land-use methods, incorporating them into conservation rather than trying to wholesale import new approaches. There is great variety among sacred groves, including the degree of taboo enforcement, whether it is the animals, trees, or waterways that are sacred, and whether their importance derives from a historical event or from a creation myth. This variety necessitates a culturally informed and locally flexible approach—not a “one-size-fits-all” conservation approach. Instead of a firm division between in-reserve and out-of-reserve, conservation approaches should mirror the traditional divisions of core, buffer and transition zones—and allow the ancestral communities to care for the land in their traditional ways. This will take advantage of their generations’ accumulated knowledge about the land and ensure that the community has a solid stake in preservation. More education about controlling bush fires, ecosystem management, and sustainable methods of agroforestry is also important. Finally, outside groups can help alleviate the pressures of poverty by funding microcredit enterprises and other alternative income-generating ventures, and by providing locals with more fuel-efficient stoves. Ecotourism also has significant potential to benefit communities by providing income derived from traditional practices, but local control is essential in order to retain a sense of personal investment. Friends of the Earth-Ghana, which has initiated a tree-planting and educational campaign about sacred groves that is rooted in the Guako grove, outside the capital city of Accra. Ghana Association for the Conservation of Nature, which strives to protect endangered species and ecosystems through public education and community-based work, including sustainable farming and harvesting industries. Nature Conservation Research Centre, which works to protect Ghana’s natural and cultural diversity through ecotourism, community-based conservation projects and field research. Amoako-Atta, Boakye. Preservation of Sacred Groves in Ghana: Esukawkaw Forest Reserve and its Anweam Sacred Grove. Paris: UNESCO Division of Ecological Sciences South-South Co-operation Programme, 1998. Anane, Mike. “Religion and Conservation in Ghana.” In Implementing Agenda 21: NGO Experiences from Around the World, edited by Leyla Alyanak and Adriene Cruz. New York: United Nations Non-Governmental Liaison Services, 1997. Campbell, Michael O’Neal. “Sacred Groves for Forest Conservation in Ghana’s Coastal Savannas.” Singapore Journal of Tropical Geography 26.2 (2005): 151-169. United Nations Commission on Sustainable Development.“Buoyem Sacred Grove Conservation Project.” Sustainable Development Success Stories. United Nations Educational, Scientific and Cultural Organization (UNESCO). “Bia Biosphere Reserve.” Man and Biosphere (MAB) Biosphere Reserve Directory.